Some of you may know this tale already, but in the light of recent events, I wanted to tell it again. Slim Jim was a dog I rescued from a beach in August 2016. I was there with a small group of friends and he staggered over looking for scraps. He was so malnourished and weak he could barely stand up. Every single bone on his body was protruding through his skin and his eyes were clouded and unfocused. As he collapsed in a heap beside us, I knew that he was coming home with me. He watched us warily as we picked him up and took him in the boat back to the mainland. He was far too weak to protest, but he was trembling and did not take his eyes of us. I have rescued dogs in many conditions and from many different situations, but Slim was by far and away the most complicated. He suffered from bulimia and anorexia. A horribly vicious cycle that meant he would wolf down anything he could find (including rotting mangoes and dirty diapers), vomit it all back up and then be repulsed by food for days. His rehabilitation was long and intense. He didn’t trust anyone and would not allow himself to be touched for weeks. Luckily, I had 2 amazing volunteers with me – Amy and Sam. They made it their mission to get Slim back on track and they spent hours and hours with him every day. 5 tiny meals of plain boiled rice were prepared lovingly every day which slowly cleansed Slim’s digestive system and allowed him to redevelop a healthier relationship with food. Within a couple of weeks, Slim trusted them so much they were even able to give him a bath. He slept, ate, slept, followed Amy and Sam wherever they went, slept and slowly but surely adjusted to the fact that for the first time in his life, he was safe, loved and cared for. As anyone who has had a rescue animal knows, the recovery process is long and hard, but the end result is a heartwarming experience that cannot ever be accurately put into words. After 6 months Slim was a different animal – he loved to be stroked and petted, enjoyed chasing butterflies and rolling in grass, ate 2 square meals a day with no problems at all and lived to go out for a walk with us and the pack. He changed into a lovely, loyal, patient, sweet dog. Very sadly, Slim died a little while ago. 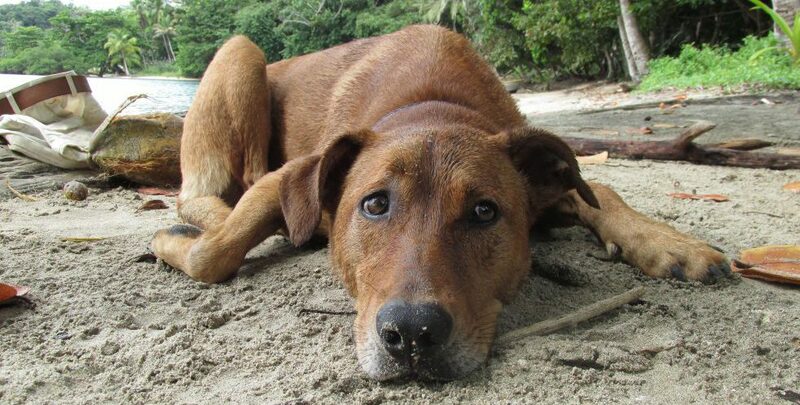 Tick fever is a common problem here in Panama and most dogs can contract it and recover with no issues. Unfortunately, Slim had no natural immunity to it (probably exacerbated by surviving on scraps in his developmental puppy days). This had been a recurring problem, but every time it happened it got worse and worse and eventually he was not strong enough to fight it. While I am desperately sad that Slim has gone, and I miss seeing his little face gazing up at me, I am so incredibly grateful that I got to spend time with him and that I was able to experience his transition from a wary, starved street dog to a happy bundle of joy that genuinely seemed to relish the second opportunity that life had given him. It is so incredibly difficult to work with animals who are prone to sickness and blame yourself and question what you could have done differently in situations like this, but I know in my heart of hearts that if I had not taken Slim off that beach last year, he would’ve died a long time ago. At least I was able to give him a happy, safe, secure and fun filled home for his last months. I would like to thank all the people who did their absolute best to in helping Slim – Amy, Sam, Amina and Julius, Dr Manuel and Silvia, thank you for your generosity, love and patience.